Use the maximum triangle side to limit where contours are formed. 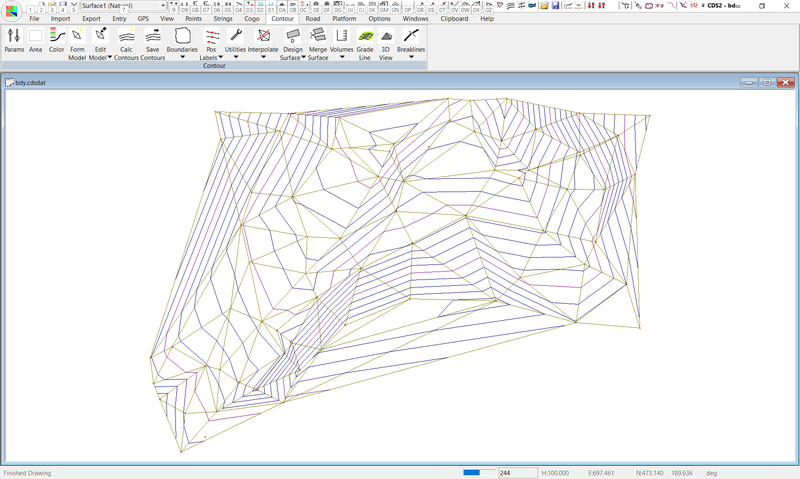 Select and delete individual triangles. 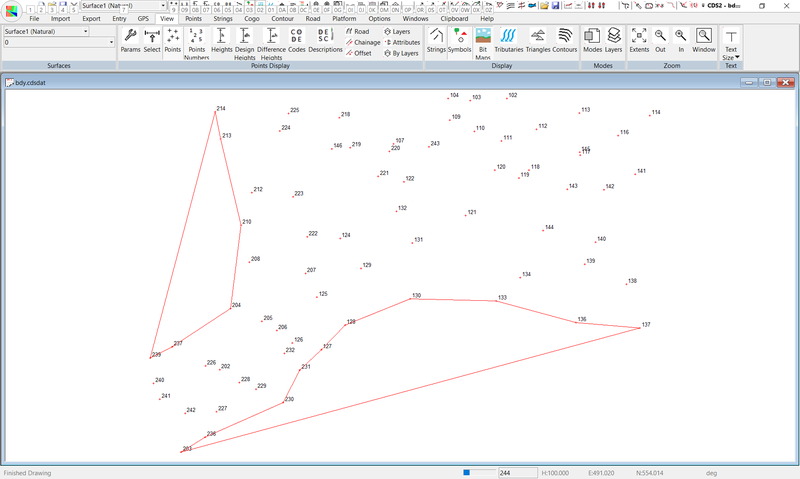 Select and delete triangles within a polygon. Enter boundary strings into a Contour model. Use boundaries to remove unwanted contours. Use boundaries to remove unwanted triangles. You have been provided with a Job named “bdy” in the \Foresoft\cds2\Tutor folder and you should Start CDS, and use File Open to open bdy.cdsdat. Now select Contour, then Surface Parameters and select reset to make sure the program reads the full extent of heights in the job. Set the Major Contour interval to 2 and the Minor Interval to 0.5.Also reset the Surface Point Selection to use all the points in the job. Now calculate the contours and allow them to be saved. Your job should now look like that below. Now while this may at first appear to be a reasonable result, particularly if you have never seen the site, I regret to inform you that it is not quite correct, and there are a number of areas where triangles and contours are formed when they have no valid reason to be there. For example on the southern area of the job, there is a run of points around a ‘curve’ from point 230, through 130 and up to 137, and these points are in fact around the boundary of the particular parcel of land.Likewise, on the eastern boundary there is another ‘curved” run of points from 239 in to 204 and up to 214, and these points also follow the boundary of the land. Now, your client will complain enough about your fee for providing a contour plan of her land without having contours drawn on the neighbours block as well, so we need to examine ways of removing the excess contours. In broad terms, you can either prevent the triangles forming over the areas in the first place, or remove them after they have formed, and there are essentially three ways in which you can go about this exercise. Limit the maximum triangle side to prevent ‘large’ triangles forming. Insert strings and remove the triangles inside the strings. The first method is rather crude in its application, and it is best suited where there are large concave excess areas, with a good coverage of points in the remainder of the job. If you look closely at your points you will see that you really don’t wish to form any triangles that have a side larger than the distance between points 210 and 204. So, press ‘J’ to get a join between these points and you will find out that the distance is a little over 85 metres. 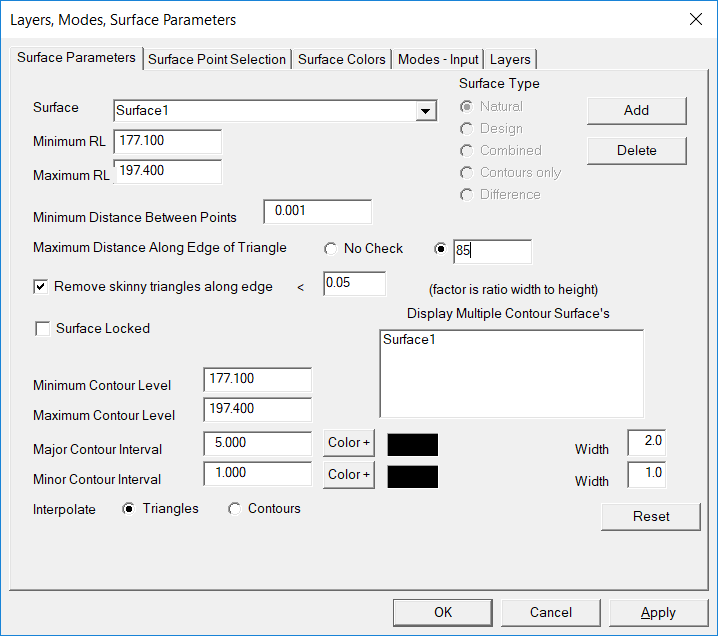 Now pull down your Contour Menu, select Surface parameters and set the Maximum triangle side to 85 as seen in the screen at right.Once this is accomplished, you should again pull down the contour menu, and now select Form Model. The triangles should now appear as seen below right. As you can see, we have removed the triangles in the concave areas, but we have been a little over enthusiastic in other areas and have left holes in the parcel.While the tool of Maximum Triangle Side is not the correct one for this particular set of data, it is important that you are aware of its capabilities so you can use it where the data is more closely defined in the body of the job. As you can see, we have removed the triangles in the concave areas, but we have been a little over enthusiastic in other areas and have left holes in the parcel. While the tool of Maximum Triangle Side is not the correct one for this particular set of data, it is important that you are aware of its capabilities so you can use it where the data is more closely defined in the body of the job. 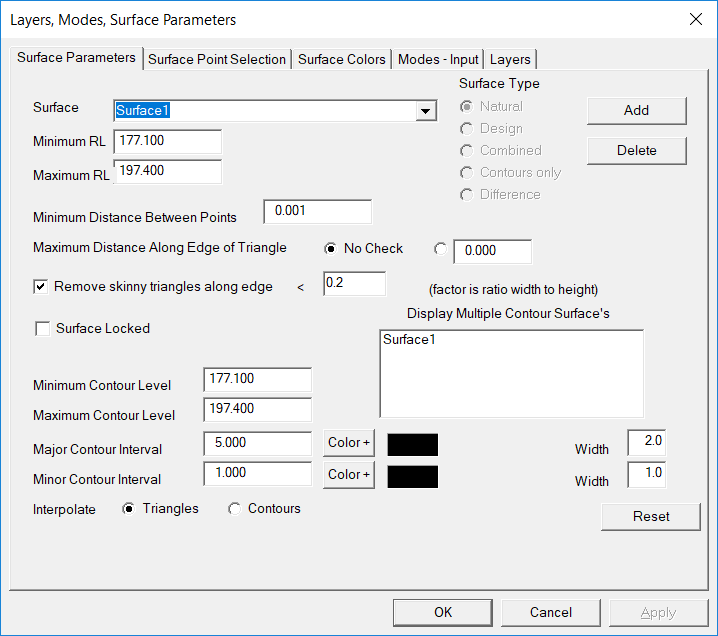 Go back to your surface parameters, set the maximum Triangle side to “No Check” and then re-form the model, and we will go on to show you a better method of controlling where contours are drawn. Once the triangles have been formed, you can either select them manually, as described next, or enter in closed strings to contain and delete the unwanted ones, and it is up to you to learn the various methods, and then decide which method is most applicable to the job in question. Now that you have the triangles reformed to their default state, we will look at how you can manually select triangles and have them deleted. Pull down the Contour Menu, and select the Edit Model option. You can select individual triangles by simply pointing to them. First you need to select this option, and you will see your cursor changes to a crosshair with a triangle in the centre of it. You then position this cursor within the triangle you wish to select and press your left mouse button. You will see the triangle changes colour to indicate that it is selected. You may then continue to select other triangles as needed. Please note that if you select adjacent triangles, the ‘common’ side will revert to its original colour, and only the perimeter of the selected triangles will be shown in a different colour. For example, in this job if you first pick the triangle made up of Points 230,133 and 136 you will see it change colour. If you then select the triangle next to it made up of points 230, 127 and 133 you will see that the common line from 230 to 133 reverts to its original colour and the outside of the two triangles remains blue, or whatever colour you have set up on your machine. 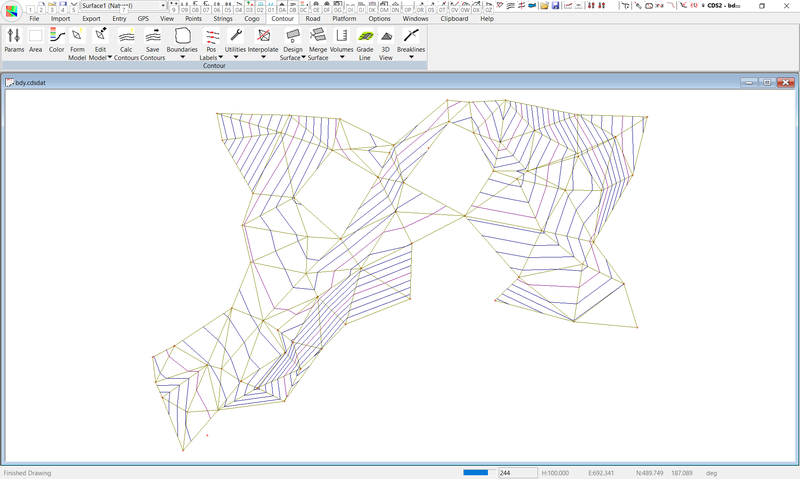 Once you have selected all the triangles required, pull down the Contour menu again, highlight the Edit Model option, and pick Delete selected triangles and you will have achieved the end result. Remember then to again pick the Select Independent triangles option to turn it off and return your cursor to the normal pointer. While doing this if you make a mistake there is an Undo option. After making a mistake from the "Entry" menu select "Undo" and the last triangle/triangle's delete is undone. This option allows you to draw a polyline upon the screen. Any triangles that intersect this polyline are selected. This option is particularly powerful for selecting triangles in this situation and is recommended. To start polyline move mouse and left click. Move mouse again and left click at end of line. Continue constructing the polyline. When finished hit the enter key on the keyboard and the appropriate triangles will be selected. This option allows you to construct a polygon around the area where you wish to remove triangles. Only triangles that are completely within the polygon will be selected. To use this option, pull down the Contour Menu, followed by Edit Model, and then pick Select Triangles by Polygon. Then drag your cursor around to build the polygon you require, and press the Enter key once finished. The screen at right shows the Polygon, and the perimeter of the selected triangles within it. You will now see the perimeter of the triangles you have selected change colour, and, providing you have got the polygon in the correct place, you can then use the Delete Selected triangles Option. 3. Insert Strings and remove Contours in areas enclosed by the strings. Before we start on this process there are a number of fundamental rules that you must keep in mind if you intend to use strings to remove contours or triangles. All strings MUST be defined in a String Folder named “BOUND”. 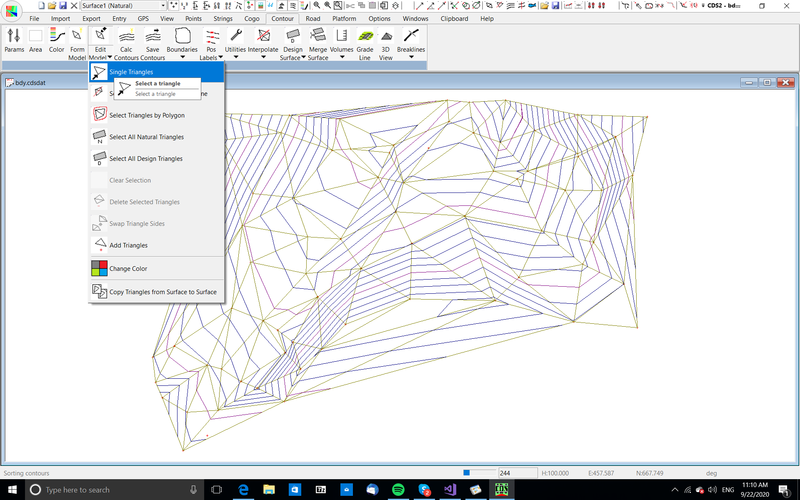 You can elect to delete the contours/triangles either Inside or Outside of the closed string. If you intend to use a string to delete contours/triangles Inside the string, you should commence the String ID with the letter I e.g. In1, In2 etc.. If you intend to use a string to delete contours/triangles Outside the string, you should commence the String ID with the letter ‘O” e.g. Out1, Out2 etc. Now you need to add in the strings, so pull down the Strings Menu, and Select the Add option. Type ‘bound’ in the folder name and press Tab or Enter to move to the String Id field. Enter a String ID of IN1 to indicate you wish to delete Inside the string. Once you have entered the first string, Select Apply. At this point the screen at right should appear, with the boundaries displayed. (If the triangles are in your way use the F8 key to turn them off).If you now turn your contours on, (with the F7 key) the screen will appear as below left. 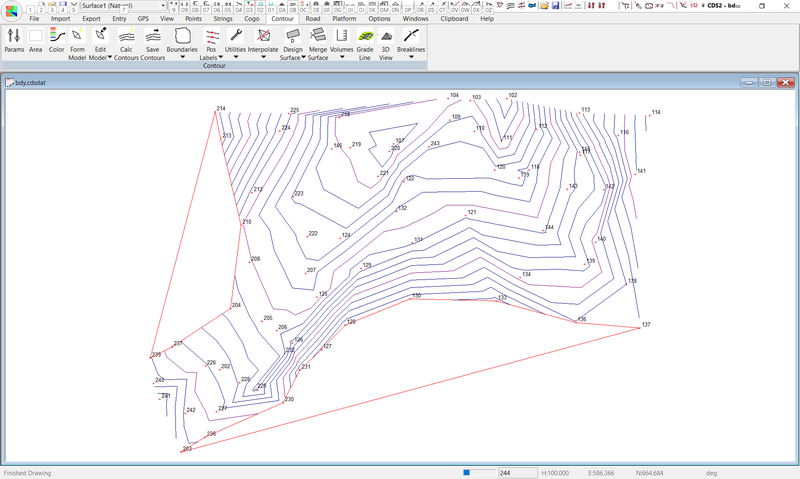 Now pull down the Contour Menu, Select the Boundaries Option, and select Contours. A pop up window will scroll through the contours being processed, and the screen will be redrawn as seen above right. At this stage, you have removed the contours outside the area of interest, so you can get a plot out showing what you need. However, you MUST be aware that this method, while quick and effective in terms of presentation plotting is not the ultimate method of removing the unwanted parts of the model. In fact, this method does not touch the underlying model at all, and if you press the F8 key to display the triangles, you will see that the original triangles still cover the areas where there is not supposed to be any data. If you were to select the Option to Calculate Contours again, you would again have contours where contours are not meant to be. And, if you used this model for the calculation of Volumes, it is quite possible that you might get a completely wrong answer as the model is covering an area not intended to be part of the volume calculations. So, why you ask do we have this method it doesn’t do everything needed? The answer is because it is the fastest way for you to get the plot you are looking for. While in this example there is effectively no difference between the time taken to remove contours and the time taken to remove triangles, on large jobs the time taken for the triangle removal can be considerably longer. So, if it is for purely cosmetic reasons that you wish to remove contours from some areas of the job, this method is perfectly adequate, but if you wish to use the job to calculate volumes, it is strongly recommended that you use the Triangle method described below. For this method, the procedure is identical to that you already been through to remove contours, except that when you pull down the Contour Menu and select Boundaries, this time you pick Triangles instead of the contours option you picked previously. I leave it for you to use the Triangle method by yourself.